How to Print WhatsApp Messages on iPhone? Often it may happen that you may wish to print your contacts or messages that are present on your iPhone. So, what essentially do you do? Don’t you want to know some easy ways which can help you print the WhatsApp messages on iPhone or from the iTunes/iCloud backup with ease? Here, we are going to help you know just that. 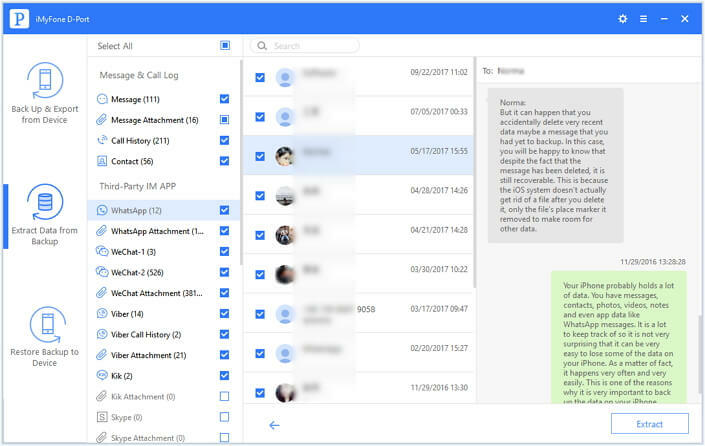 iMyFone D-Port iPhone Data Exportor is the best tools which you can use for printing WhatsApp messages on iPhone or iPhone backups. Here are some of key features which it has to offer. Besides WhatsApp, it can export photos from iPhone, extract videos from iTunes backup and download messages from iCloud backup. As many as 20 types of files can be extracted from iPhone/iPad/iPod and backups. 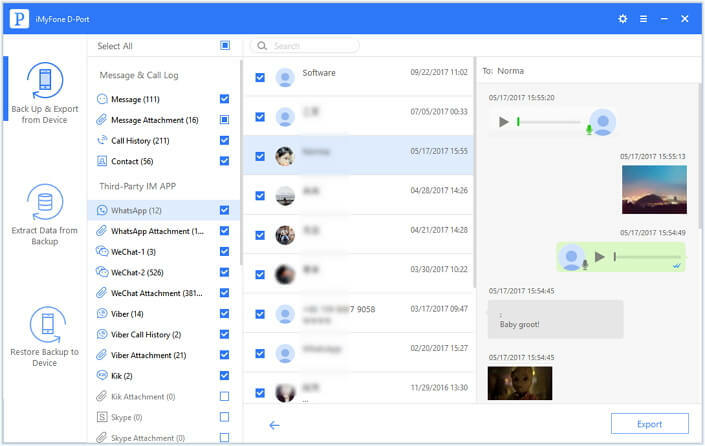 It is also a flexible backup tool which allows you to backup all the data and settings on your device or just particular type of data like Messages, WhatsApp data, or WeChat data. It supports iPhone/ iPad/ iPod touch runs iOS 10/9/8/7, even iOS 11. You can have a try of the function "Restore Backup to Device" which is a feature of the pro version. This is the first method which you can use, as long as the iPhone is available. Here are the steps you need to follow. Step 1: Download iMyFone D-Port software and install it. Now connect your iPhone to your computer and choose the option "Back Up & Export from Device". Then click "Export Data". Step 2: Now, from the option, you can choose the files which you want to extract. In this case that are WhatsApp. And you can choose all the types, also. 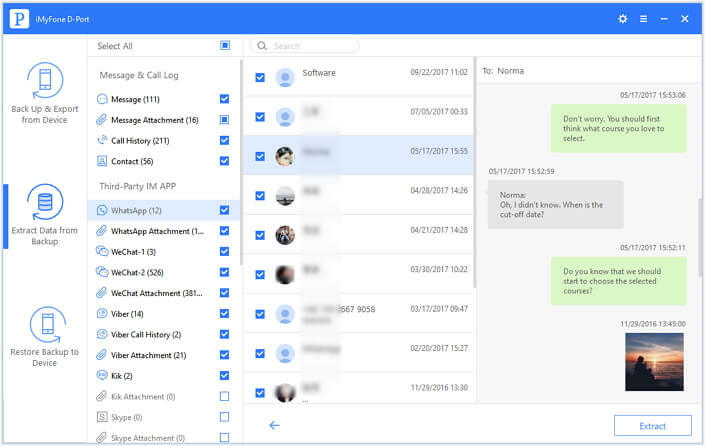 Click "Next", and the software will look for the WhatsApp messages. 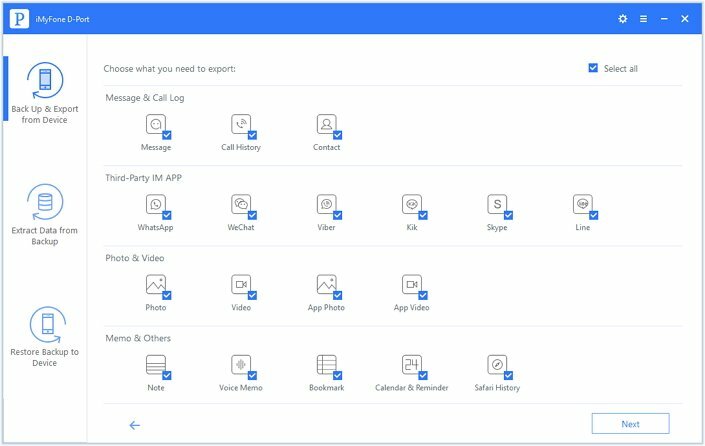 Step 3: You can then preview the WhatsApp messages and select the ones which you want to save after the scanning is completed. Click on "Export" and save the messages on a location of your choice. Now, you can easily print these WhatsApp messages whenever you want. When you are looking to extract the WhatsApp messages from your iTunes backup, you can do that too. Let us see the steps. 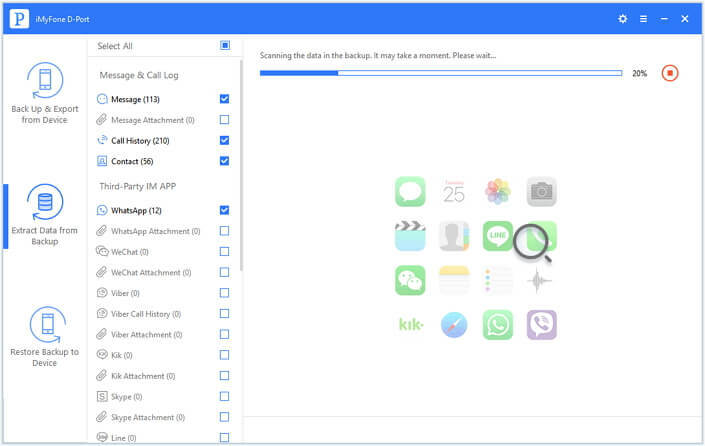 Step 1: Download and install the iMyFone data exporter on your computer. 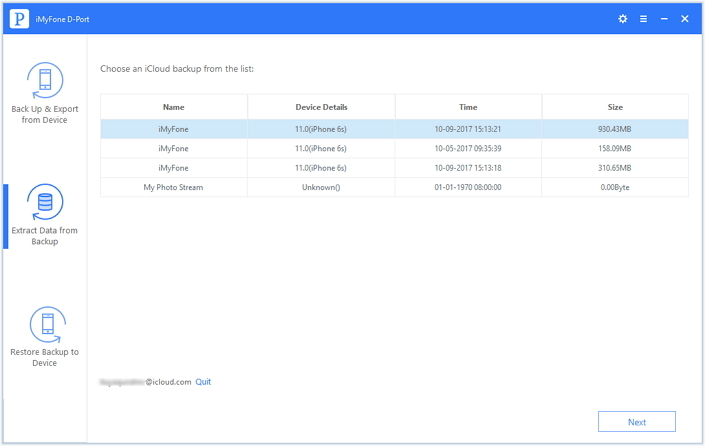 Select the option "Extract Data from Backup" and choose an iTunes backup which includes the WhatsApp messages that you want to print. Click "Next" then. Step 2: From the options offered, choose WhatsApp, or other data types as you want to extract them. Click "Next" to go on. Then the data exporter tool will scan the backup and pick out the WhatsApp messages in the backup. Step 3: After the scanning, preview the WhatsApp messages and select the ones you want to extract. Click on "Extract" and save the messages at the desired location on your computer. Now, you can easily print these WhatsApp messages whenever you want. You can also choose the option of extracting your WhatsApp messages from iCloud backup as well. Let us see the steps you need to follow. Step 1: Download and install iMyFone D-Port on your system. Choose the option "Extract Data from Backup". Then click "Download iCloud Backup". 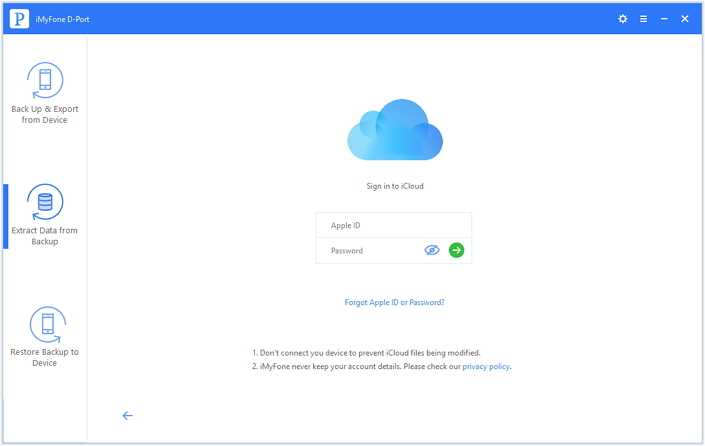 Step 2: Now you will be prompted to sign in to you iCloud account. Enter your credentials. Step 3: From the available backup list, select the one you want to extract WhatsApp messages from. Then choose the data type that you want to print. Here is WhatsApp. Then click "Next" and the program will start to download the backup. Step 4: After the scanning, preview the files and choose the ones you want to print. Click on "Extract" and store the messages at your desired location. Now, you can easily print these messages whenever you want. 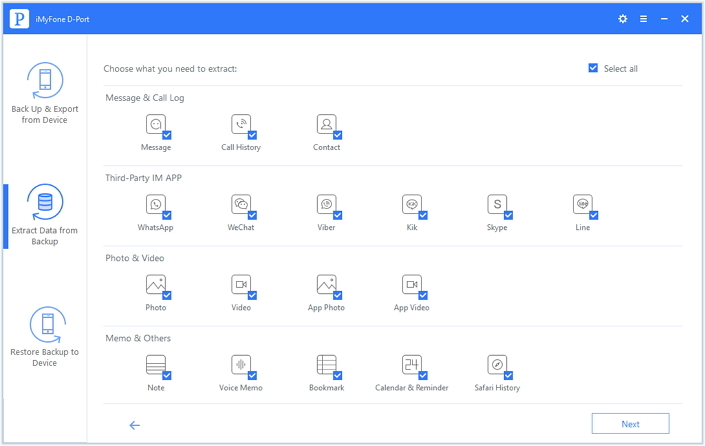 These are the simple steps which you need to follow and you will be able to easily print your WhatsApp messages as and when you want. Feel free to follow whichever method you like best. All the steps are simple and the software is easy to use as well. 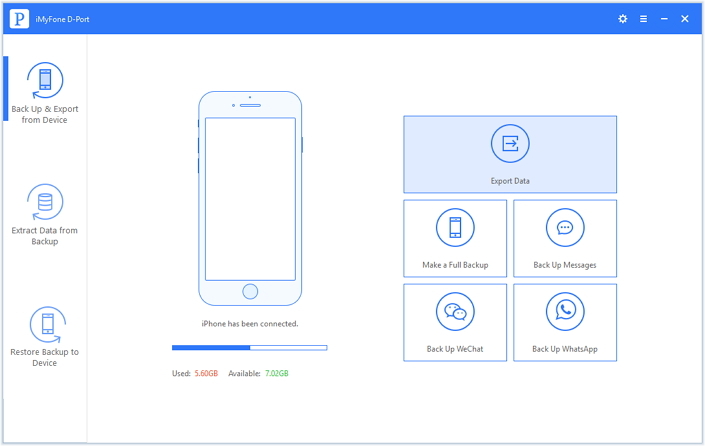 Now download free trial version of iMyFone D-Port iPhone Data Exportor to extract WhatsApp messages from iPhone, iTunes backup or iCloud backup easily and then print them for any of your future uses.